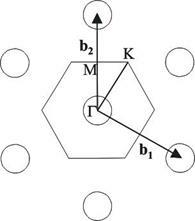 Abstract: Starting from basic undergraduate-level electromagnetics (Maxwell’s equations) a simple method of finding band diagrams is described. Using the information here, it should be possible to fully understand what band diagrams mean, what they describe, and how they can be calculated. A simple program could easily be written. While not the most efficient method computationally, this is a good introduction to the business of band diagrams and is probably the easiest method to understand. Right click to download a Mathematica program useful in performing planewave expansion method calculations. Left click to go to the download site for MathReader, free software which allows Mathematica code to be viewed for study even if Mathematica is not installed. Note that the forms for and are identical. This is expected because is constant in the equations. However, the relative permittivity is not constant in our structures (it is periodic), so the placement of the term is strict. The goal here is to find the energies and electromagnetic field configurations that are allowed to exist in a periodic structure. Essentially, what we are given in the problem is the , which will be a function of location, and we need to solve for and the fields. There are essentially three different choices of procedure at this point. All four equations, given a dielectric function, will yield one set of field distributions. (The and expansions give identical results.) After that, the other fields can simply be deduced from Maxwell’s equations. The question of which equation to solve depends on several factors. First, the equations for the magnetic fields (Equations (7) and (8)) are in a Hermitian form. Strictly speaking, the operator is Hermitian (see  for a detailed description of this property). Hermicity establishes that the eigenvalues are real, and that field distributions with the same eigenfrequency must be orthogonal. Usually, Hermitian eigenvalue problems are less complex computationally to solve , but the other forms should not be immediately overlooked as will be clear in the development which follows. The fields themselves and the dielectric function can be expanded in Fourier series along the directions in which they are periodic. This Fourier expansion will be truncated to a fixed number of terms, limiting the accuracy of the calculation. The truncated problem will yield an eigenvalue equation for the fields which will allow calculation of the dispersion curves. It must be pointed out that regardless of which of the four decoupled equations is solved, the eigenvalues will be the same. For a fixed number of terms, the accuracy can be improved by a proper choice. For example, when solving a problem of air spheres embedded in a dielectric, using the expansion would yield much better convergence than the others, while using the or expansions would yield better results for dielectric spheres in air . The analogy with the two-dimensional structures discussed here suggests that air cylinders drilled in a dielectric background may be a problem better suited for calculation using the expansion, in terms of matrix size. The accuracy differences among the three expansions result from the different resultant spatial orientations and positions of each field. The basic approach for calculating the field distribution and eigenfrequency given a dielectric function and propagation vector is to first expand and the three components of the appropriate field vector in Fourier series. These series are then substituted into the decoupled Maxwell’s equations and the terms are reorganized into an ordinary eigenvalue problem. When the eigenvalues are calculated employing standard numerical methods (using a finite-sized matrix formed when the Fourier expansions are truncated), it is straightforward to use the eigenvalues to find the allowed propagation frequencies, and the eigenvectors to calculate the field distributions. The process is best illustrated by a simple example. The simplest example of a photonic crystal is a one-dimensional array of air slabs penetrating a dielectric background. Figure 1 shows the relevant axes. In this case, we will consider only waves propagating in the +z direction. In most photonic crystal dispersion curves, it is usually difficult to distinguish curves as “transverse magnetic" (TM-like) or “transverse electric" (TE-like), but in this simple case there are two basic polarizations, viz., and . Here we consider the . case only, and begin the problem by assuming that the only field components present are , , and . Although the justification for this may not be immediately apparent, the symmetry in the problem permits this. There is also nothing wrong with using all components of and ; the mode separation is then easily seen. (Indeed, this is the method used in higher-dimensional photonic crystal problems.) Here, the purpose of the early simplification is to more clearly illustrate the method. Figure 1: One-dimensional photonic crystal consisting of air slabs of width d embedded in a dielectric background with a periodicity of a. Now, Fourier series expansions for the field and dielectric can be applied. In this case, a Fourier expansion for the inverse dielectric function is used. Equivalently, the constant can be moved to the right side of the equation and could be expanded. This would form a generalized Hermitian eigenvalue problem, or an ordinary eigenvalue problem if an additional matrix inversion were carried out in the subsequent step. In the notation that follows, will represent all Fourier coefficients. The indices m and n are integers. The variable means “Fourier coefficients, indexed by the integer n, for the y-component of the electric field” and the variable means “Fourier coefficients, indexed by the integer m, for .” Ideally, the summations should be infinite, but will be truncated for computation purposes. Note that if propagation in a direction other than z had been included in the formulation, then the additional terms would have been included in Equation (14). After the Fourier expansions are substituted into Equation (12), the initial eigenvalue equation is obtained. The matrix Q can be diagonalized using a variety of software packages and numerical methods, and the details will not be discussed here. After diagonalization, the eigenvalues and eigenvectors will be known. The eigenvalues give the dispersion diagram and the eigenvectors can be substituted back into the Fourier expansion for to find the field distribution at any given frequency. All information is now available to solve the Q matrix for the eigenvalues. Figure 2 shows the results for nine plane waves (n and m are integers between -4 and 4 inclusive). In this case, a structure was chosen with a unit period, , and . Several bandgaps are clearly visible for propagation in this direction. In this example we have examined only the case for propagation in the z direction. The interested reader is referred to  for a discussion of the case and off-axis propagation in the one-dimensional structure. In studies of photonic crystals, the interest is usually not in the electric or magnetic field forms themselves. It is the eigenvalues that carry information on the location of the modes in momentum space. In the general case, varying values of , , and allows construction of a complete band diagram. In more complicated structures, the band diagram is usually constructed at the boundaries of the Brillouin zone. 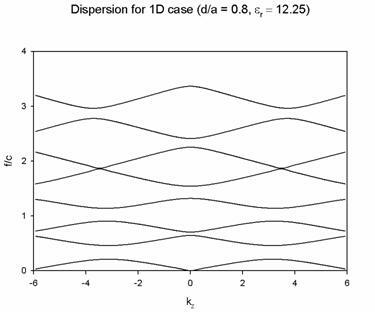 Figure 2: Dispersion curve for propagation in the z direction for the one-dimensional photonic crystal structure. Note the presence of several bandgaps. Essentially, the method remains the same for more complicated structures. Because of our interest in two-dimensional structures, we examine here the case of the triangular lattice of air holes embedded in a dielectric background. 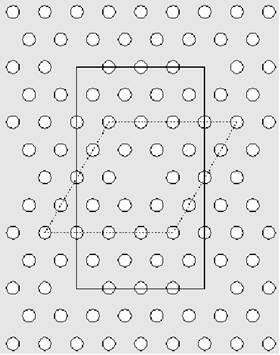 Using fabrication techniques described in the next chapter, arrays of holes can be created using electron beam lithography and etching methods. The result is a two-dimensional array of air holes in a semiconductor substrate. Therefore, for our interests the dielectric function will be periodic only in the xy plane (uniform in the z direction). This results in some simplification for the expansion. Although the structure studied is two-dimensional, propagation in all directions (including the out-of-plane propagation case) will be considered. Extension of this method to three-dimensional structures is straightforward and will be explained. In the equations used, a is the lattice spacing of a unit cell; the lattice itself is triangular within a medium with dielectric constant perforated by infinite air holes (atoms) of diameter d. The 2D triangular lattice unit cell has been widely covered in literature [2,3,5,8] and the method described here has been tested and gives equivalent results for the same problems. In this development, the triangular lattice supercell is further generalized to the N x N case and method accuracy is treated. First, we discuss the unit cell. Figure 3: Real lattice vectors for the 2D triangular lattice. Figure 4: Reciprocal lattice vectors for the 2D triangular lattice. Figure 5: Unit cell. The dotted line represents the actual cell and the solid line represents the area covered by the integral in the dielectric Fourier coefficient computation. In previous studies of the triangular lattice unit cell, 140 to 225 plane waves were used [1,2,3] to calculate accurate dispersion curves. Villeneuve and Piché  tested the convergence to 841 plane waves and found that only 225 were necessary for good convergence. The accuracy of any given set of curves is difficult to predict because the convergence rates can change between differing structures. The plane wave expansion method was carried out to construct dispersion curves for along the Brillouin zone shown in Figure 4. The method described using the expansion creates spurious modes with zero frequency, which were removed. Also, in the in-plane propagation case modes can be separated by polarization into TE-like ( is in the xy plane) and TM-like ( is in the xy plane) modes. Two examples have been carried out with = 13.2 using 441 plane waves. TE-like modes were separated from the result and are shown in Figures 6 and 7 for values of and along the Brillouin zone. 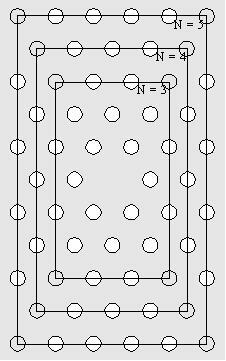 The gap between the first and second bands changes with the lattice dimensions, where d refers to the diameter of the air holes, and a to the lattice spacing. Figure 8 shows the variation. Figure 6: TE-like modes for air holes embedded in a background of = 13.2 with d/a = 0.5. Figure 7: TE-like modes for air holes embedded in a background of = 13.2 with d/a = 0.8. Figure 8: Variation of TE mode gap with lattice parameters. The two bands plotted are the two bands with the lowest eigenfrequencies ( = 13.2). 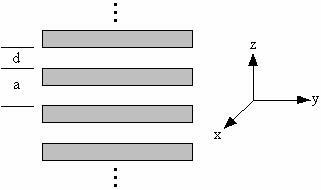 If a defect is introduced into the otherwise periodic structure then defect modes can arise in the photonic band structure. To study defect modes, the same plane wave expansion method can be used. The basic idea is to replace the unit cell by a more complicated unit cell and preserve the periodicity. For example, a 4 x 4 supercell with a central defect can give reasonable accuracy because the missing holes are spaced four lattice units apart. 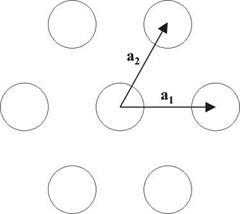 As long as confined modes do not couple to one another, then the results of the calculation should equally apply to the case of an isolated defect (missing hole) in a large array of perfect photonic crystal. Supercells are often used to calculate defect states in photonic crystals [9,10], although different authors choose to use different sizes. Although a 4 x 4 supercell is a reasonable size cell for most calculations, in order to study certain modes with more accuracy larger supercell structures may be needed. In this thesis, the dielectric coefficients for the general case of an N x N supercell with a point defect have been derived. Figure 9: Example of a 4 x 4 supercell. The dotted line represents the supercell itself, and the solid line represents the area covered by the integral in the dielectric Fourier coefficient computation. Figure 10: N x N supercell area of integration. 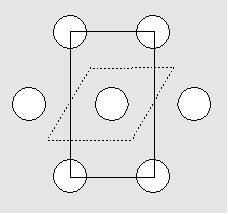 For a given N, the four corner atoms that the rectangle cuts will not be present; the whole atoms inside the rectangle must be included (except the central defect). An example of a supercell calculation was carried out for a defect in a 2D photonic crystal for the out-of-plane propagation case using a 4 x 4 supercell. Figure 11 shows the fundamental mode in this case. This is a plot of , or the time-averaged electric field. Because of the tight confinement of the mode around the defect, a larger supercell would not give significantly different results in this case. It does become important for higher-order mode calculations or calculations at lower frequencies, where the confinement is not so tight. In this case, the confinement of the energy within a one lattice unit radius is 98.19%. The plot was generated by substituting the eigenvectors back into the Fourier expansion for the electric field. Figure 11: Near field plot of lowest eigenmode ( ) for a structure of d/a = 0.3, = 0, = 0, , = 12.25. 1089 plane waves were used in each direction. Figure 12 shows the in-plane defect mode calculated using a 4 x 4 supercell. In this case, the defect mode is superimposed on the TE-like modes of the unit cell. Folded bands from the supercell itself are not shown for clarity. Note that the defect band appears almost in the middle of the gap. This demonstrates that adding a defect introduces a localized confined state that is not present in the bulk photonic crystal. 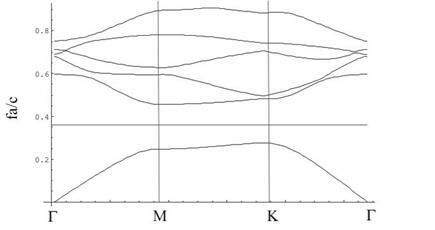 The dispersion curve of the mode is independent of frequency because of this localization. As increasing numbers of planewaves are used, the eigenvalues approach the correct values asymptotically. For the 4 x 4 supercell, Figure 13 shows this behavior. For this case, i = 12 should give sufficient accuracy for band diagrams around the point of calculation shown. (This should correspond to i = 3 for a unit cell structure.) 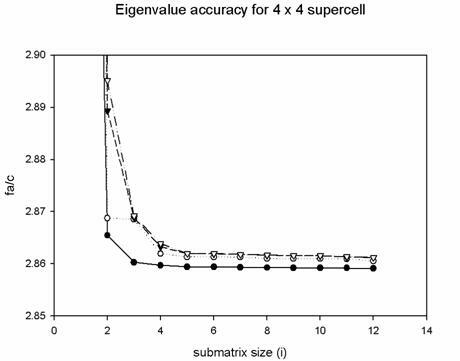 At high frequencies the accuracy for a given number of planewaves decreases, and the size of the supercell, if too small, will give incorrect defect mode eigenvalues because of coupling between adjacent supercells. 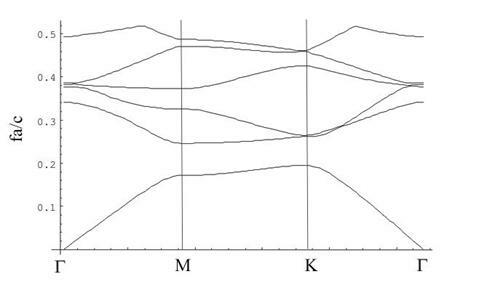 Figure 13: Plots of the four lowest eigenfrequencies (bands 1, 3, 5, 7 in ascending order) as a function of the (i x i) submatrix size, which is related to the number of plane waves given by . The structure is a 4 x 4 supercell with d/a = 0.20, = 12.25, and the position of calculation is = 0, = 0, . With increasing numbers of plane waves used, each of the four curves approaches its actual value asymptotically. Still, the question remains which expansion ( , , or ) will give greater accuracy for a fixed matrix size. The relationship was analyzed in  and it was found that for air holes in a square lattice the expansion gave consistently better convergence results, even when large numbers of plane waves (1000) were used. It is evident that for structures presented here, the expansion should be used for this method. Other methods exist for solving the eigenequation. Instead of solving for all the eigenfrequencies at once, iterative techniques can be used [5,9,12] to find eigenvalue and eigenvectors pairs one at a time. These methods seem to rely on ordinary Hermitian eigenvalue problems, so the is exclusively used. Computing time can be saved by use of the fast Fourier transform to carry out the operation in Fourier space, instead of real space as was done here . These methods usually suffer from poor convergence times at high frequencies . The plane wave method presented here can also be extended to calculate transmission spectra [1,8,14], as well as modal characteristics [15,16]. M. Plihal and A. A. Maradudin, “Photonic band structure of two-dimensional systems: The triangular lattice,” Phys. Rev. B, vol. 44, no. 16, pp. 8565-8571, 1991. 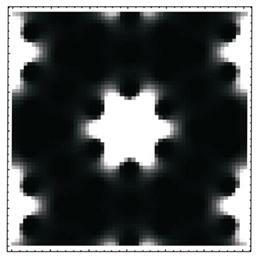 P. R. Villeneuve and M. Piché, “Photoinc band gaps in two-dimensional square and hexagonal lattices,” Phys. Rev. B, vol. 46, no. 8, pp. 4969-4972, 1992. R. D. Meade, K. D. Brommer, A. M. Rappe, and J.D. Joannopoulos, “Existence of a photonic band gap in two dimensions,” Appl. Phys. Lett., vol. 61, no. 4, pp. 495-497, 1992. K. M. Ho, C. T. Chan, and C. M. Soukoulis, “Existence of a photonic gap in periodic dielectric structures,” Phys. Rev. Lett., vol. 65, no. 25, pp. 3152-3155, 1990. J. D. Joannopoulos, R. D. Meade and J.N. Winn, Photonic Crystals: Molding the Flow of Light. Princeton, NJ: Princeton University Press, 1995. H. S. Sözüer and J. W. Haus, “Photonic bands: Convergence problems with the plane-wave method,” Phys. Rev. B, vol. 45, no. 24, pp. 13962-13972, 1992. J. D. Shumpert, “Modeling of periodic dielectric structures (electromagnetic crystals),” Ph.D. dissertation, University of Michigan, 2001. K. Sakoda, Optical Properties of Photonic Crystals. Berlin, Germany: Springer, 2001. T. Søndergaard, “Spontaneous emission in two-dimensional photonic crystal microcavities,” IEEE J. of Quantum Elect., vol. 36, no. 4, pp. 450-457, 2000. S. G. Johnson and J. D. Joannopoulos, Photonic Crystals: The Road from Theory to Practice. Boston, MA: Kluwer Academic Publishers, 2002. Z. Y. Yuan, J. W. Haus, and K. Sakoda, “Eigenmode symmetry for simple cubic lattices and the transmission spectra,” Optics Express, vol. 3, no. 1, pp. 19-27, 1998. S. G. Johnson and J. D. Joannopoulos, “Block-iterative frequency-domain methods for Maxwell’s equations in a planewave basis,” Optics Express, vol. 8, no. 3, pp. 173-190, 2001. S. G. Johnson (private communication), June 25, 2002. A. Barra, D. Cassagne, and C. Jouanin, “Existence of two-dimensional absolute photonic band gaps in the visible,” Appl. Phys. Lett., vol. 72, no. 6, pp. 627-629, 1998. N. Yokouchi, A. J. Danner, and K. D. Choquette, “Effective index model of 2D photonic crystal confined VCSELs,” presented at LEOS VCSEL Summer Topical, Mont Tremblant, Quebec, 2002. J. C. Knight, T. A. Birks, R. F. Cregan, P. Russell, J.-P. de Sandro, “Photonic crystals as optical fibres - physics and applications,” Optical Materials. vol. 11, pp. 143-151, 1999. October, 2007: Jack (Zetao) Ma of Shizuoka University, Japan kindly provided a correction to Equation 39. January, 2011: Wang Wei of Jilin University, China kindly provided corrections to Equations 18 and 19 and the text after Equation 15.